8998.8 GBP Contact for Availability. Please phone 0333 2000 750. Easy and comfortable. How do you improve on an already great recumbent bike experience? You make it as comfortable as a great chair. You start by making sure it features the same Morse Taper bottom bracket and pedal system that is unique to Star Trac bikes. That’s exactly what Star Trac did. Then, thye kept going with a modern iconic design offering the industry’s most comfortable back rest, a walk-through frame design, heart rate bar and adjustable reading station, dual-platform pedals and Star Trac’s signature personal fans. The result– a recumbent bike that’s the coolest looking and feeling ride on the floor. Telescoping hand grips adjust to fit every user and allow access to the contact HR. A flexible platform that connects expert partners to provide solutions for every customer today and into the future. Users can now browse the web or stream music and video directly to the OpenHub™ consoles from their own phone or tablet. You can also watch television on the oversized 15” embedded screen or by adding the optional personal viewing screen to the 10” and LCD models. This optional tablet holder can be added to the top of any LCD or 10" OpenHub™ console. Able to hold tablets up to 10.1” diagonal screen size, the tablet holder puts the user’s personal entertainment in the ideal position for viewing, while holding it secure. OpenHub™ offer tons of features and solutions to meet the unique needs of every facility. 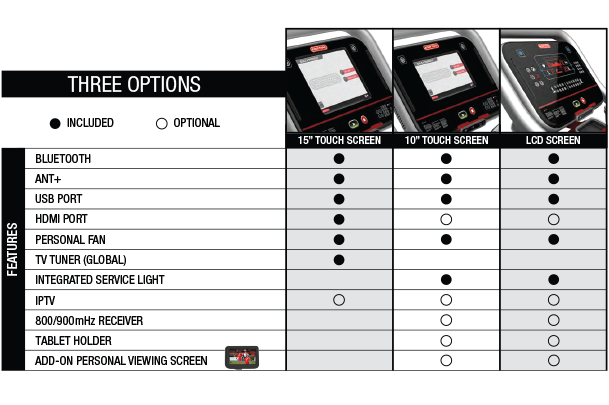 The flexibility of the console allows for additional features to be added at any point, meaning you can get and pay for what you want, when you want it. No other manufacturer offers the affordable range of connectivity as StairMaster and Star Trac.